Le prometteur Abi a provoqué la surprise jeudi en infligeant au grand champion Kakuryu sa deuxième défaite. Lors du dernier combat, le maegashira de 24 ans a échangé une rafale de coups avec le yokozuna avant de le faire reculer. Abi améliore son score à 2-3. 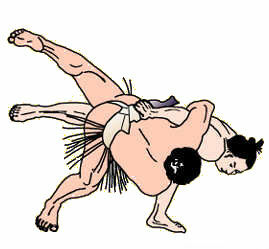 C’est la deuxième victoire d’Abi sur un yokozuna après avoir vaincu Hakuho en mai. « Je suis très bien soutenu par les fans aujourd’hui, je n’aime pas perdre, alors je me suis senti vraiment encouragé« , a-t-il déclaré. L’ôzeki Tochinoshin et le sekiwake le Mitakeumi ont tous les deux maintenu leur score parfait. 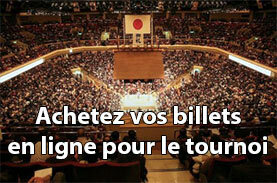 Pour sa première compétition depuis qu’il a été promu ôzeki, Tochinoshin, a utilisé ses compétences pour vaincre le vétéran maegashira 1 Kotoshogiku (1-4). Après un faux départ, le puissant Géorgien a lutté contre l’ancien ôzeki et s’est rapidement emparé de la ceinture de son adversaire avant de le forcer à sortir. Le sekiwake Mitakeumi continue dans sa forme impressionnante en surmontant le tenace komusubi Shohozan. Shohozan (1-4) a été rapidement conduit hors du cercle en essayant de compenser l’avantage de poids de son adversaire de 26 kilos par une attaque rapide, mais Mitakeumi a facilement repoussé son avance à l’aide de son bras gauche. Mitakeumi est revenu sekiwake après avoir combattu en mai comme komusubi. 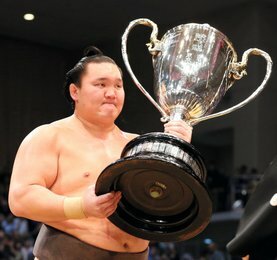 L’ôzeki Takayasu est à 4-1 après avoir battu Ikioi (1-4). 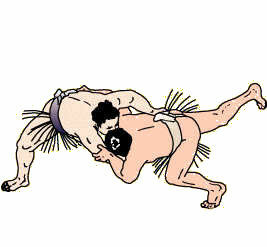 Le maegashira, qui a infligé la veille à Kakuryu sa première défaite, a chargé bas contre Takayasu, mais l’ôzeki a réagi intelligemment en glissant et pour envoyer son adversaire à terre. L’ôzeki Goeido s’est frayé un chemin vers la victoire face à Chiyonokuni, imposant rapidement au maegashira à reculer. Le sekiwake Ichinojo (2-3) a vaincu Shodai (1-4). Le géant Mongol a absorbé la charge, les gifles et les poussées du maegashira avant de le pousser d’un seul bras. Le komusubi Tamawashi (2-3) a décroché sa deuxième victoire en battant Takakeisho (2-3) avec une poussée vers le bas. Le vétéran mongol a utilisé sa main droite pour dévier l’attaque de son adversaire et le renverser au bord de l’anneau. Endo maintient ses espoirs de remonter dans les rangs sanyaku avec sa quatrième victoire contre Kagayaki (2-3). 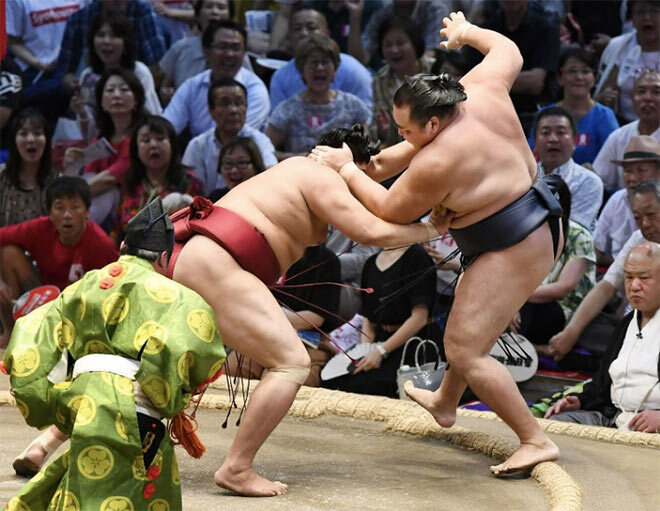 Up-and-coming youngster Abi caused an upset Thursday at the Nagoya Grand Sumo Tournament by handing grand champion Kakuryu his second loss. In the final bout on Day 5, the 24-year-old No. 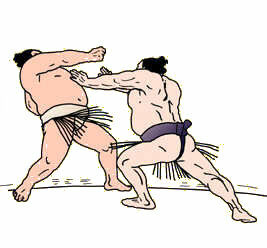 3 maegashira exchanged a barrage of blows with the Mongolian-born yokozuna before forcing him out backward. Abi improved to 2-3. 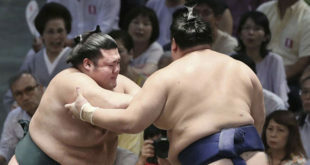 The victory at Dolphins Arena was Abi’s second over a yokozuna in consecutive meets, having beaten Hakuho at May’s Summer Grand Sumo Tournament. « I got good support from the fans today. I don’t like to lose, so I felt really encouraged as they urged me on, » the Saitama native said. 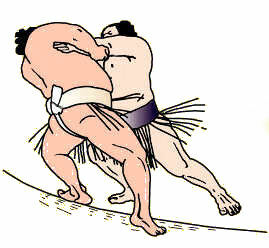 Ozeki Tochinoshin and sekiwake Mitakeumi both maintained perfect records one third of the way through the 15-day tournament. 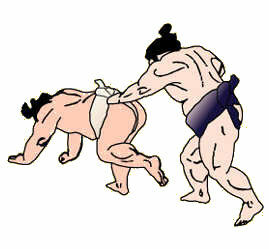 Fighting in his first meet since being promoted to sumo’s second-highest rank, Georgian-born Tochinoshin used his grappling skills to overcome veteran No. 1 maegashira Kotoshogiku (1-4). 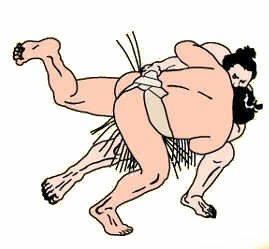 After an initial false start, the powerful European battled the former ozeki for position from the jump, eventually gaining a belt hold and forcing him out. 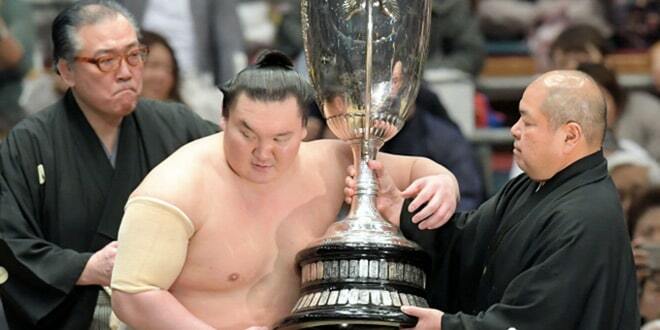 Contesting a ninth-straight meet among the three « sanyaku » ranks below yokozuna, Mitakeumi continued his impressive form by overcoming tenacious komusubi Shohozan. Shohozan (1-4) was characteristically quick off the mark as he tried to overcome his opponent’s 26-kilogram weight advantage with a speedy attack, but Mitakeumi easily repelled his advance and shoved him out of the ring with his left arm. Mitakeumi, who climbed back to sekiwake after fighting in May as a komusubi, is chasing his first championship. 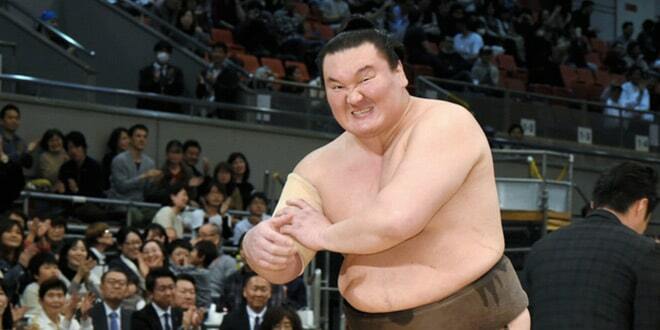 Ozeki Takayasu improved to 4-1 by slapping down No. 2 Ikioi (1-4). 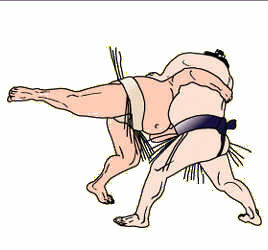 The maegashira, who handed Kakuryu his first loss the day before, launched himself low and hard at Takayasu, but the ozeki reacted smartly, slipping to the slide and sending his opponent to the clay. 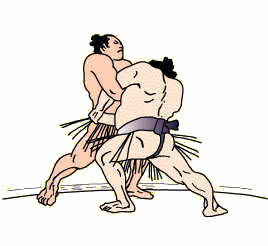 Ozeki Goeido bulled his way to victory over No. 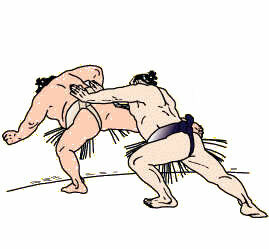 2 Chiyonokuni, quickly forcing the maegashira backward after getting a strong inside position from the jump. Chiyonokuni (3-2) was chasing a third win over a sanyaku opponent on the clay in Nagoya but lasted just seconds against the determined Goeido (3-2). The biggest man in the division, sekiwake Ichinojo, improved to 2-3 with a victory over No. 1 Shodai (1-4). The Mongolian-born behemoth absorbed a barrage of slaps and shoves from the maegashira before thrusting him out with a one-armed shove. 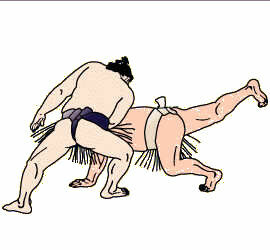 Komusubi Tamawashi (2-3) picked up his second victory by beating No. 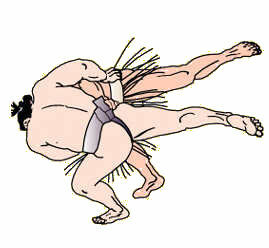 3 Takakeisho (2-3) with a thrust down. 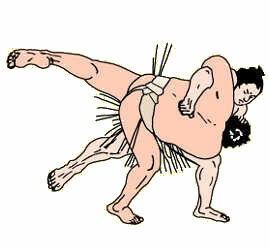 The Mongolian veteran used his right hand to deflect his opponent’s attack and topple him at the edge of the straw. No. 6 maegashira and fan favorite Endo maintained his bid to climb back to the sanyaku rankings by improving to 4-1 with a victory over No. 4 Kagayaki (2-3).